Today's post was originally published September 2012. It remains one of my most popular. 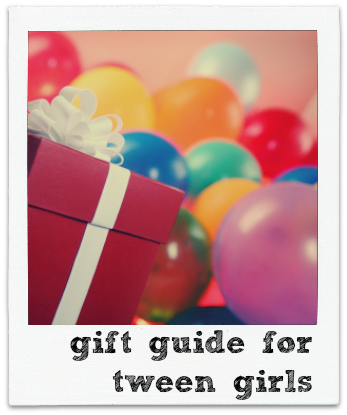 And with good reason: it's a detailed gift guide for a group notoriously hard to buy for - tween girls - put together with help from my own tween. Seems fitting that I feature it in the middle of 31 Days of Birthdays. If you're looking for what tween girls really want, read on. Natalie is not in a hurry to grow up. It's one of my favorite things about my fresh 11-year-old, she of the sweet spirit and quick smile. She isn't lured by the pop and sparkle of modern tween culture. She doesn't care much about clothes or make-up, and she scoffs at the hysteria over Justin Bieber. She rolls her eyes at self-conscious teenagers "trying to look cool." She isn't a young girl anymore, but she's not a full-fledged young woman either, and she's OK with that. She's as confident and comfortable in her own skin as an 11-year-old can be. I share all that so you know my motivation for sharing this list. After her birthday party a few weeks back, Natalie and I chatted a while about what kind of gifts a tween girl like her might like. Many gift guides online these days focus more on the 11-year-old who is ready for a cell phone, Taylor Swift concert tickets and a bag of spa products. That is not Natalie, and I know there are many girls out there who share her preferences. Hence, this gift guide for tween girls - also known as, gifts my 11-year-old loved getting.